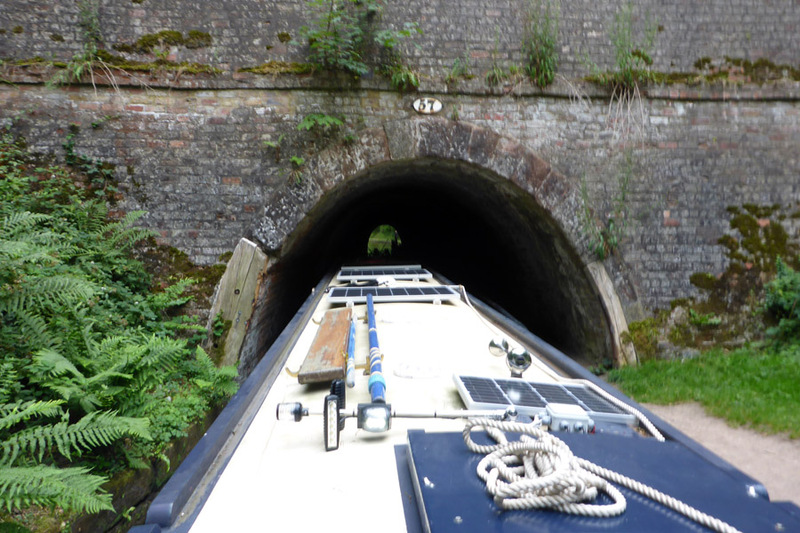 Days 3 and 4 of the Llangollen canal Expedition: countryside; bridges; tunnels #narrowboat #england – The Diesel-Electric Elephant Company. The trials and tribulations of Day Two of the expedition having been gibbered out of our systems, the intrepid explorers, Hutson and Hutson, move on. Days Three and Four feature a bit more of the Llangollen canal without the life-or-death situations. Most splendid. The Llangollen canal is hugely rural, and hugely shallow – the Cardinal continued to scrape bottom at numerous points along the way, even though he is within the “you need to be this air-draught/beam/water-draught to ride this canal” specifications. Days Three and Four were a relentless, grinding enjoyment of narrow bits, blind bends, threading the 57′ needle through the bridge hole, more lift-bridges with eccentric hydraulics and, eventually, the first of the three canal tunnels that we shall meet. In the manner of a restaurant critic (more of that later, too) I’m writing it up as “green, pleasant, with a surprising emphasis on the work-ethic of the Victorian era”. The Bro and I suffered view after view after view, and I think that it’s only fair that you should too. Lift bridge, with mechanism designed by The Mr Universe Foundation. Crank that windlass! Feel that flabby excess drop away! Yes, thanks fellas, thanks a bunch. Parker? Follow that boat. Yes, m’lady. Damned greenery, ruddy ancient stone bridges, a veritable sneeze-fest of ten thousand varieties of wild-flower. Add in the distant church bells and the sound of cows lowing, belching and releasing methane and you get the idea. Aspirin help, but not much. The new-fangled Monsanto cows. This new cylindrical design simply rolls up and down the field in formation, cropping the grass as it grows. Then, when full of the stuff of milkshakes, they roll themselves along the motorways to the factories. No farmers required. Thing is, on a narrowboat, you sort of get to see England’s back gardens. A chap floats past at 2mph with a view of nothing more than the country’s skirt-bustle. On the Llangollen it’s just countryside and more countryside – but it’s not Hackney, it must be said that it’s not Hackney (or any other over-warm city borough), and that’s a good thing, a very good thing. WELCOME! Have you had the Bubonic Plague before, or is this your first time? We duly carried on, and when lunchtime beckoned, I spotted a convenient bench, a bench without dire warnings and threats, and I waggled the waggly-steery stick and aimed for it. Lunch this day took place in a shaded and quite dingly dell. No change there then. Cold collation and small ales. However, all good meals must come to an end (apparently, although I fail to see why), and so we moved on with both turbines whistling and both screws thrashing. To the entrance of the first ever tunnel that I have taken the Cardinal through. Just to show that the fates can be sanguine when pressed, this was the Ellesmere, the shortest of the three that we shall meet at only 80 metres. Narrowboats sort of steer from a point somewhere between the middle and a third of the way back from the bow. When the pointy end goes one way, the blunt end tends to hang out in quite the other direction. There are no brakes, none at all. The steering position on mine is right at the back (some boats have a wheel in the middle section). In general terms, I am trying to neatly place 6′ 10″ width of boat in probably an 8′ hole some fifty+ feet distant, using the waggle-stick and rudder. With due regard to their being no-one else coming through in das opposite direction, I edged the good Cardinal towards the entrance and flicked on the instrument lights and the rinky-dinky LED tunnel light. In we went, like hobbits to Middle Earth. It’s just the same as threading a narrowboat along an ordinary canal really, except that it’s all pitch black, and once the flow of water decides to go to either port or starboard of your bows there’s little chance of persuading it otherwise. We went through on a sort of “crab” motion. What did we encounter? More ancient stone bridges to thread through. Bridges under railways where no railway runs anymore since Dr Beeching’s machete-swipes at the system in the nineteen-sixties, with looming brickwork left lying around anyway, since, meh? and whatever! So, there you are, that, my little fruitbat’s willy-warmers, was our Day Three and our Day Four. Thankfully without the incident-intensity of Day Two, but still with the high drama of a near-overdose of the “it’s the scenery, do you see?” [Welsh accent there please]. Father nearly bought a Beetle when I was a vile young brat kid, it was almost a metallic blue 1303S, but it didn’t happen because they wouldn’t supply a left-hand-drive one in England, if you can believe such automotive parochialism. Now, on Day Three we had lunch in a most meritorious pub. Private moorings but for the use of customers right outside the door, good menu, pleasant and helpful staff. More of that one later. The Lion Quays. Looks good, doesn’t it? I’ll tell you otherwise, later! That, jadies and lentilmen, concludes the drama associated with the outward-bound trip to get us to all of the toys that the Llangollen canal offers for the young-at-heart boater to play with – next blog post; the big bigg bigggg aqueducts and the big bigg bigger tunnels… in combination with my manoeuvring under the watchful eyes of a very international audience. It’s all go, you know. Even on the Llangollen. The action so far has all taken place in England. Next post we cross into… the Wales. Chini-chin for the moment &etc. Many thanks for the re-blog, I hope that your readers enjoy this! Thank you, sir. May your bananas always be yellow, and slightly curved! I must say that they (canal engineers) really seem malicious. I mean, shouldn’t a tunnel be at the end of a long straight way. Not ‘Turn Right To Enter.’ That seems sort of sadistic. But. I can see where they might resent the absolute bucolic perfection that a boater is experiencing and feel like dues must be paid. I’m looking forward to the aqueduct. Until you starting writing about I didn’t know it existed. I love learning about new things. Yet another tale of master steering and splendid boatery; is this the same #boatman who could barely sail a straight line some weeks ago? How far you have come, Sir!